As newborns turn into infants and become mobile, everything changes when it comes to caring for them. With mobility comes additional dangers for your baby and the need for persistent supervision of their activities. With the achievement of each developmental milestone comes new challenges regarding keeping your child safe. Read on to learn more about the basics of baby proofing your home and some of our tips to help you along the way. Most parents are familiar with the concept of the eye-hand-mouth progression. Your child sees something; then they reach for it to grab it and promptly put it in their mouth. 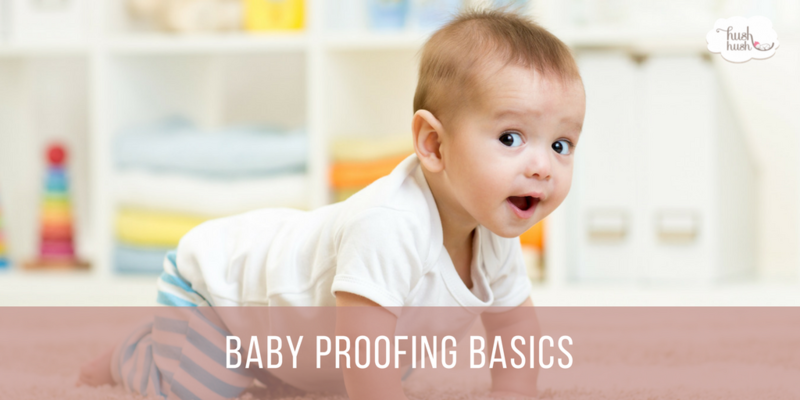 Therefore, when it comes to baby proofing, It can be beneficial to get down on the same level that your child is on to see what things may catch their eye. Perhaps it is the cord from your computer or the cabinet door where you store all your chemicals. Whatever things you see as potential dangers, your child will likely see as opportunities for exploration. Therefore, it behooves you to take the appropriate safety measures such as putting cords out of reach and putting locks on cabinet doors. There are several items around the home that a baby could potentially try to swallow or wrap around their neck. A hazard that many parents don’t think about is the cord that hangs from the blinds. The reason it is dangerous is that it is straightforward for baby to tangle it around their neck. Several devices can be purchased to help prevent this from happening such as the HomeSafe Blind Cord Shortener. However, one of the best ways of baby proofing against choking hazards is actually just being present and keeping a close eye on what your child is doing. As an infant begins to pull up or walk, there are a variety of places throughout the home where they could fall and hurt themselves. In this instance, baby proofing comes in the form of utilizing soft surfaces such as blankets and pillows for when they do fall. You can also use furniture corner and edge guards to ensure your baby doesn’t hurt their head on a coffee table or other piece of furniture.